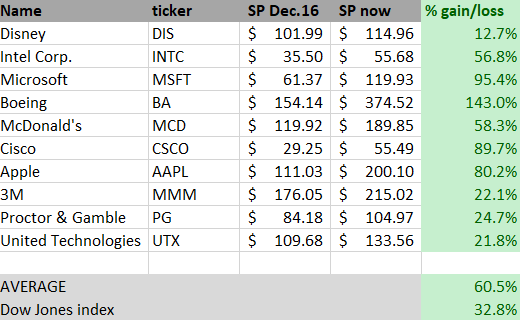 In December 2016, I introduced two test portfolios based on the 30 Dow Jones stocks. In December 2017, I introduced a third portfolio, the PEG5 Portfolio, based on the forward PE combined with 5-year expectations, excluding cyclical stocks. After 16 months, the system seems to work perfectly, beating the S&P 500 by 9% and the Dow Jones by 10%, with very stable blue chip dividend payers. We set up a new portfolio, with the current best PEG5 stocks and a new rule for quality. 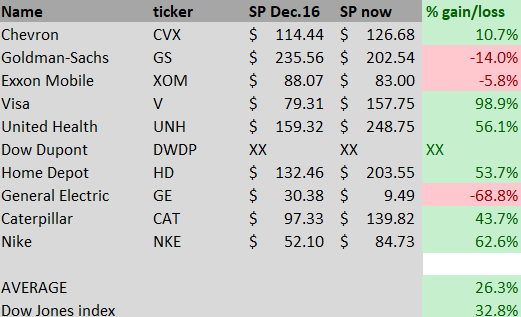 A short overview of the 10 stocks in the new PEG5. My moniker is From Growth To Value and that has a double meaning. It means that growth stocks can become value stocks if you hold them long enough. Examples: Walmart (WMT), Apple (AAPL), Intel (INTC) and many others were all blistering growth stocks for quite a while, but they have become value stocks now. But my moniker also means I cover growth stocks, value stocks and anything in between. Some readers seem to have problems with that. If you are a growth investor, I can understand that you don't care about value stocks or the other way round. What I don't understand, though, are investors who think the 'others' are stupid, shortsighted or blind. Some value investors scoff at growth investors that they invest in 'bubble stocks', while growth investors claim that value investors are silly to ignore the 'signs' of the market by buying undervalued stocks or that they invest by looking in the rear view mirror. But there are many ways to win in the stock market, on the condition that you have a strategy and that you keep following that strategy. This is an article that shows that with a solid portfolio of dividend stocks of the Dow Jones, as safe and often boring as you can get them, you can beat the indexes by a wide margin too. I have named the system PEG5. The reason for this name will become clear further in this article. The Dow Jones index (DIA) consists of 30 stocks, all large caps. Alphabetically they are: 3M (MMM), American Express (AXP), Apple, Boeing (BA), Caterpillar (CAT), Chevron (CVX), Cisco (CSCO), Coca-Cola (KO), Disney (DIS) DowDuPont (DWDP), Exxon Mobil (XOM), Goldman Sachs (GS), Home Depot (HD), IBM (IBM), Intel, Johnson & Johnson (JNJ), JPMorgan Chase (JPM), McDonald's (MCD), Merck (MRK), Microsoft (MSFT), Nike (NKE), Pfizer (PFE), Procter & Gamble (PG), The Traveler's Co. (TRV), United Health Corp. (UNH), United Technologies (UTX), Verizon (VZ), Visa (V), Walmart and Walgreens (WBA). As you can see, the A-portfolio underperforms versus the Dow Jones. And that is no real surprise. 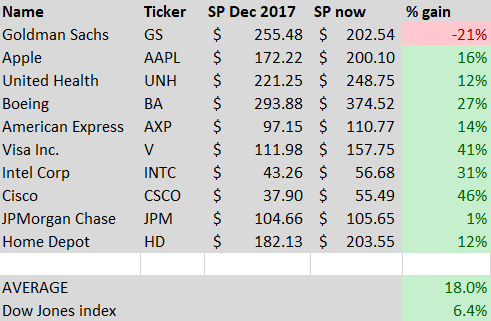 In my follow-up article in December 2017, this group of stocks already underperformed versus the Dow Jones index: -6.5%. The gap has stayed. Let's look at the performance of this group, which should, of course, be better than the two others and the index. As you see, this portfolio, let's call it C, has outperformed both A, the 'good' portfolio and B, the 'bad' portfolio, as well as the index itself, all with a wide margin. What could be the reason? In my follow-up article of December 2017, I made the conclusion that just looking at the 5-year EPS estimates was too simple. 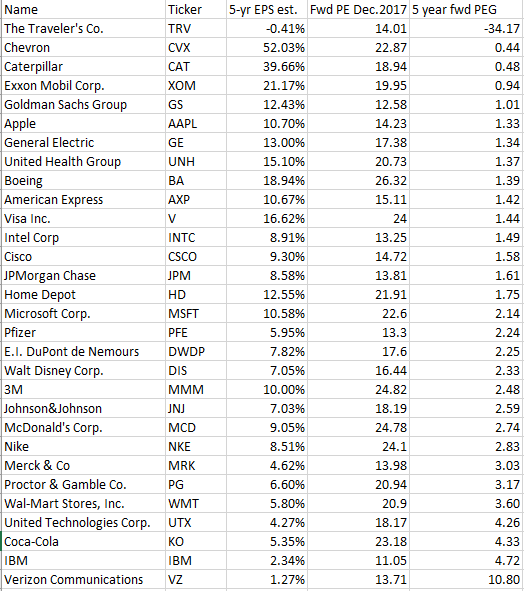 I had a look at the forward P/E ratios of the companies in December 2016. 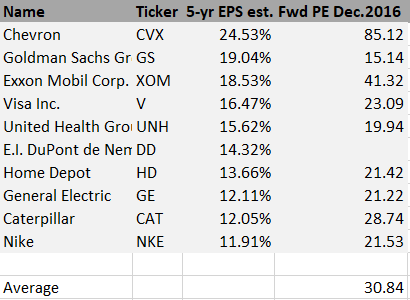 What already is clear is that two of the three worst performers in the A portfolio (CVX and XOM) have very high forward P/E ratios. DowDuPont was not merged then, so no forward P/E ratio. The average forward P/E ratio was 30.84, which is very high, especially for such stable dividend stocks. As you can see, in general, the forward P/E ratios were much lower for the 'bad' portfolio, almost half, with an average of just 15. 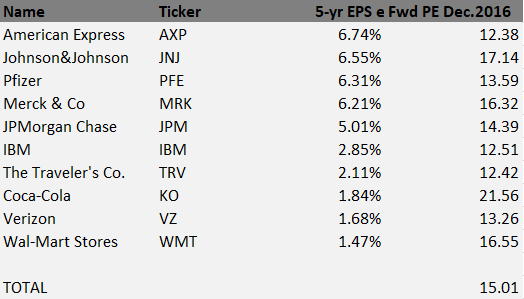 That might be expected because these companies have lower EPS growth forecasts. But maybe too much negativity was already baked in? 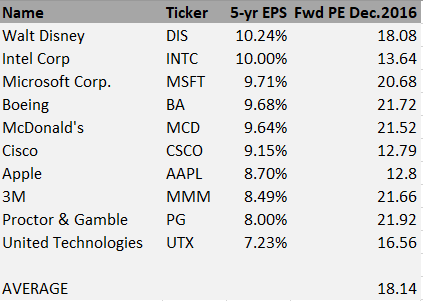 The average forward P/E is 18.14, which is quite a bit lower than portfolio A and not that much higher than portfolio B, considering that the EPS growth expectations were higher for this group. So what if we would combine the two metrics? So higher EPS growth combined with lower P/E ratios? You could call it a '5-year forward PEG' if you want or, shorter, PEG5. Now you know what PEG5 stands for. For the new portfolio, I didn't mechanically select the first 10 this time. I had some quality criteria too. For example: When I looked at the four first stocks, then I saw four stocks that I didn't want in my portfolio. The first PEG, that of Traveler's, was negative, which is always a bad sign and the three next were cyclical stocks. The EPS expectations of cyclicals swing wildly, just as the P/E ratios, depending on the state of the economy. Since I didn't know what the economy would do over the course of the next five years, I excluded them. 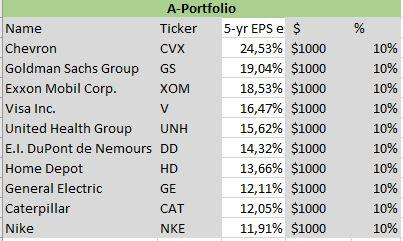 General Electric had too much uncertainty built in then already, so I avoided it in this portfolio too. So until now, the system seems to work perfectly, beating the Dow Jones index by 11.6%. If you wonder about the S&P 500 (SPY), that is up 7.52% over the same period, so the PEG5 Portfolio beats it comfortably too, by 10.5%. Now, of course, the sample of stocks may be small and the time period limited, but I think the system might work very well over long periods too. I will definitely keep track of the results over the next few years. Maybe you have been thinking: beating the S&P and the Dow Jones by more than 10%, that is all great, but what now? 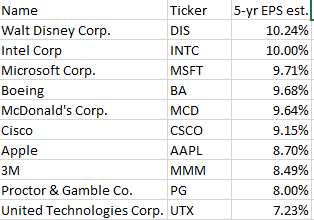 Are the same stocks still the best? Again, I want to take out the cyclicals. So no Chevron, Exxon or Caterpillar. But this time I want a criterion here too. Not just me judging, but a more objective way of measuring. I have often seen in the past that stocks that grow keep growing and stocks that decline keep declining. And often that is tightly knitted together with their earnings, of course. If we look at the earnings growth over the last five years, maybe we can filter out more objectively. 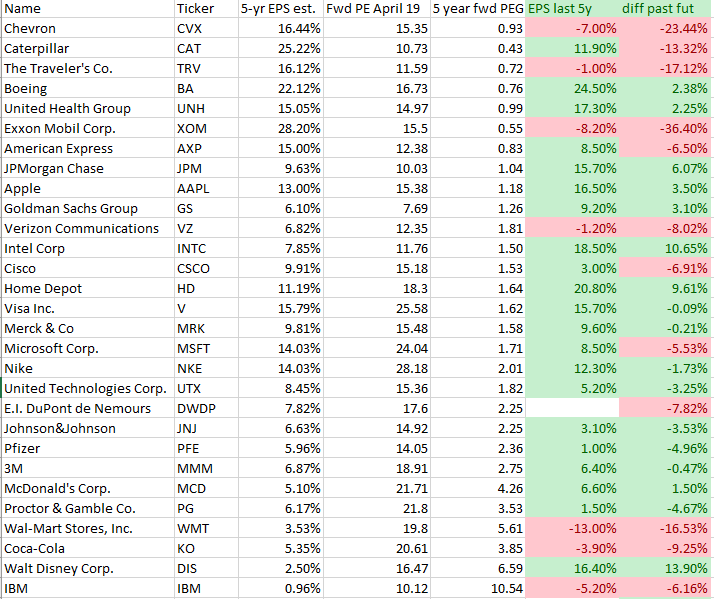 I have put that in the last column (difference past and future earnings: past minus future EPS). I will keep track of this portfolio too. I will call it the PEG5 A19 (for April 2019). I am curious to see if it outperforms the index too. I expect so, but nothing is sure in the stock market. As we all know, Boeing has had some bad publicity lately because of the crashes of the 737 MAX airplanes. That could mean some pain over the shorter term and more orders for Boeing's archenemy Airbus (OTCPK:EADSF) (OTCPK:EADSY). Over the longer term, I am pretty sure Boeing will do OK.
United Health's stock price has had some bumps recently because of the concern over government scrutiny for drug pricing and healthcare in general. Nevertheless, I think United Health will continue to do what it has done for years and years: grow by double digits each and every year. Banks have had a bad reputation since the Great Recession, although JPMorgan Chase actually was one of the few to take advantage of the crisis. 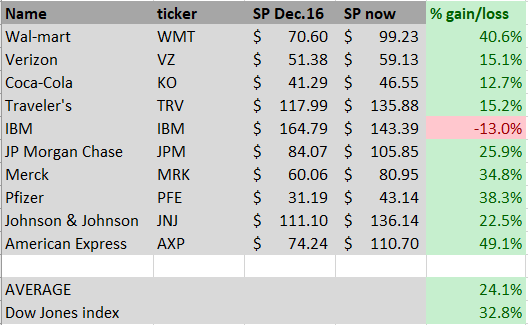 JPM's reputation is solid, but still its valuation is low, with a forward P/E of just 10. That means a multiple expansion is possible. Do I have to write anything about Apple? This is probably the most-discussed company in the world. While the peak iPhone may really have become reality now, there are services to (partly?) compensate the slowdown: Apple Music, the App Store cash cow and now also its video streaming platform Apple TV+, Apple Arcade (games), the Apple Card (a credit card), Apple's push into health and much more. Another bank and even a lower valuation: a forward P/E ratio of under 8. The expected growth of GS for the next five years is lower than that of JPM: 6.1%. GS's very low valuation represents its reputation. Journalist Matt Taibbi's characterization of Goldman Sachs as "the great American bubble machine" and "The world's most powerful investment bank is a great vampire squid wrapped around the face of humanity, relentlessly jamming its blood funnel into anything that smells like money." And according to the New York Times, Goldman's traders are known as the Bandits of Broad Street. But still, this is the past and we keep GS in the portfolio, curious to see how it will perform over the next few years. Intel is a $250B company, but it is one of the few stocks which hasn't surpassed its market cap of the dotcom bubble yet, when it reached $75.81. It is at $55.68 at the time of writing. But while it really was a bubbly stock back then, the company only trades at a forward P/E of 11.76. The stock has a solid dividend yield of 2.26% with a payout ratio of just 26%, which means there is a lot of dividend growth opportunity left. Analysts expect Intel to slow down considerably over the next five years (7.85% for the next five years versus 18.50% over the last five) but I think this might prove somewhat conservative. The home improvement market has always been seen as cyclical, but I think Home Depot is a high-quality name. The company has been able to grow its earnings by 20.8% over the last five years and if you would look further into the past, this is not an exception, but the rule. In the last 20 years, only in the Great Recession, the company's earnings went down. For the rest: all growth years, with mostly 20% and more. The growth may slow down, but I am pretty confident that Home Depot will keep growing at double digits over the next five years. Since this company came to the markets in 2008, at the worst of times, its stock price has performed excellently. It's a tenbagger over that period. But with the continuous development of the cashless society, Visa has a lot of growth left. Therefore, I think the 15% growth over the next five years, just as over the last five years, is a sign that Visa will keep outperforming the market. After Johnson & Johnson and Pfizer, Merck is the third largest pharmaceutical company in the US. Healthcare stocks are considered more recession-proof than other stocks. You will not wait to buy that medicine you need, while that fancy sports car you want is not as necessary anymore during a crisis. Merck has a dividend of 2.72% and is expected to grow around 10% in the next five years, just as in the last five years. We all know and maybe all own Nike products. I do for sure. The brand founded by Phil Knight (read Shoe Dog if you haven't yet!) is the most iconic sports brand in the world. The stock has performed very well since the end of 2017, which could make it a bit overvalued, but I am pretty confident that over the next five years, Nike will perform as well as its athletes. So far, the PEG5 system seems to work if it is quality-controlled. 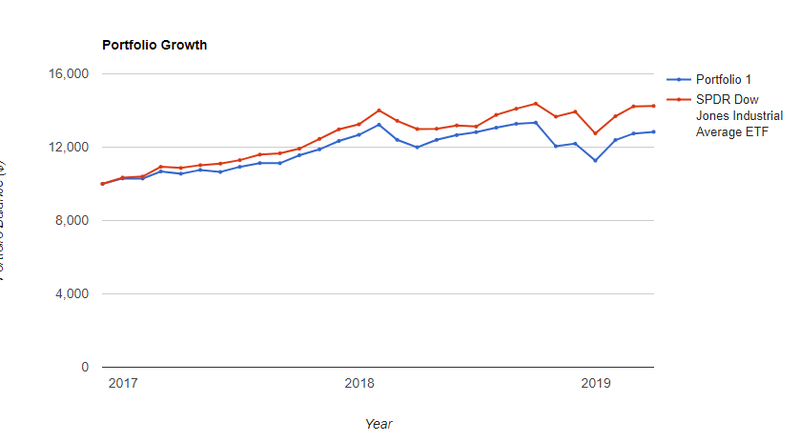 In this article, I have looked back at the performance of the system and I have introduced a more objective rule of what 'quality' might be: a comparison with the last five years. I also selected a new PEG5 portfolio, which I expect to outperform the market over the next five years. If you don't want to miss the follow-up articles or you would like more articles with a long-term investment horizon, feel free to hit the "Follow" button. In the meantime: keep growing! Disclosure: I am/we are long AAPL, NKE, DIS, V. I wrote this article myself, and it expresses my own opinions. I am not receiving compensation for it (other than from Seeking Alpha). I have no business relationship with any company whose stock is mentioned in this article.